We already know that there are four different ‘classes’ in Anthem. The robotic suits that players occupy in the game – known as Javelins – are split up into various roles. 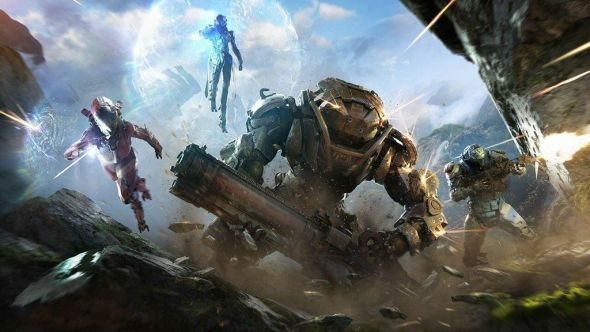 The Colossus, for example, is a tank (obviously), while the Ranger is something of a mid-range crossover unit which draws on strengths of all the other Javelins. Until now, however, the other two Javelins – the Storm and the Interceptor – have remained something of a mystery. BioWare has described the Storm as a “glass cannon” mage, but the studio has stayed very quiet on exactly what the Interceptor is. But as some fans have pointed out on Reddit, some game art might offer a clue as to what those two Javelins actually do. Check out our list for some upcoming PC games. The image you can see at the top of this article shows a Colossus soaking up fire in the centre of the image, with a Ranger firing a rifle off to the right. To the left of the Colossus is an Interceptor wielding some sort of dagger, and above that is the Storm, encased in a shield. Let’s start with the Storm – we knew they are magical, able to float and phase and wield magic powers. In this image, we can see the Storm hidden behind its own shield, but it also seems to be casting a shield on the Interceptor, prompting some fans to believe it might occupy some sort of support role. That would be out of step with what BioWare has suggested, of course, but it could still be a viable way to build your character. The Interceptor is the only Javelin in the picture that’s actually moving, and it looks to be doing so pretty quickly, suggesting speed will be important to the character. It’s also wielding a dagger, which suggests melee combat will be a key part of its kit. Think something like Zero from Borderlands 2 – a melee-focused character in a game primarily concerned with ranged characters. I’m envisioning an assassin-themed Javelin, intended to get around an enemy and deal significant burst damage. This is all speculation, obviously, but we’ll likely find out more closer to the Anthem release date on February 22, 2019. If you’re not going to be able to pick it up straight away, never fear – Anthem veterans will be rewarded for helping noobs earn their wings. That should help you get off the ground reasonably easily – just hope you get a good teacher.